I spent the entire day and part of the evening in Kyoto, one of the most historic and important cities in Japan. 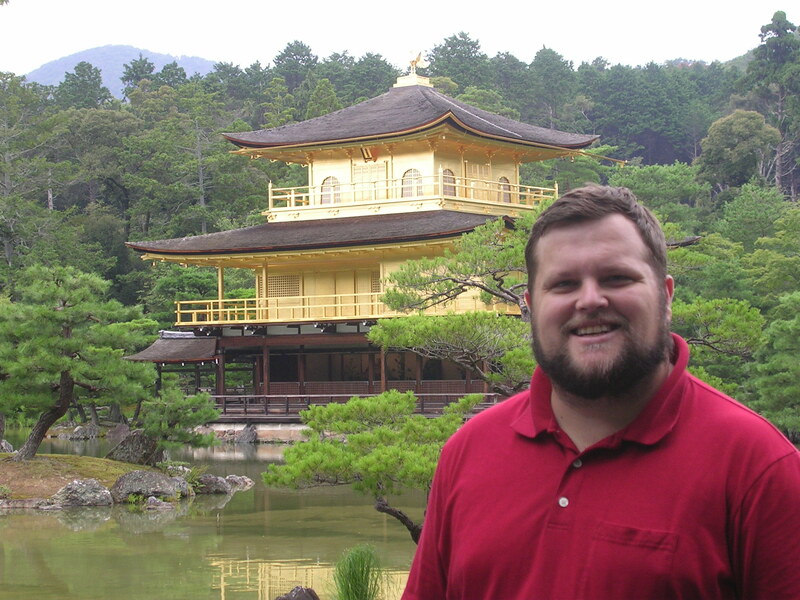 Here I am at the "Golden Temple." For some reason, it looks like I've been Photoshopped in, but I'm really there. Ochiai-san, one of the Tsubaki priests, and I visited most of the big tourist destinations and at least one, the Umekoji Steam Locomotive Museum, that’s a bit more off the beaten path. In order, we went to: Ryoan-ji, renowned for its Zen rock garden; Kinkaku-ji, usually known as the “Golden Temple”; Nijo Castle, which was closed but still looked cool even from the outside; Heian Shrine, one of the largest Shinto shrines; Yasaka Shrine, a historic and colorful Shinto shrine; and Kiyomizu-dera, a gorgeous Buddhist temple overhanging a valley. There was also lunch, dinner at a sushi restaurant (going out on a limb for me), and some good shopping in Kyoto, not to mention some adventure in finding a bank that would exchange dollars for yen. 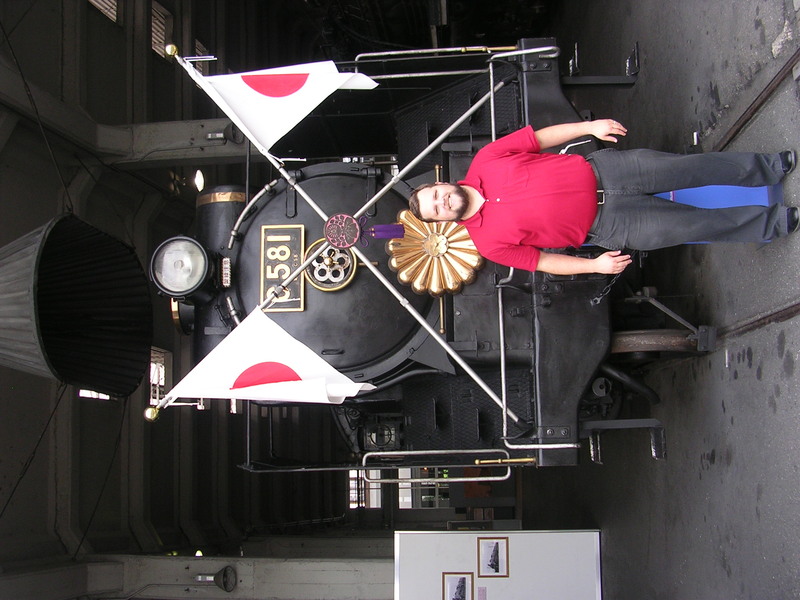 I'm standing in front of one of the Imperial trains, which the Emperor of Japan used to travel around the country in the first half of the 20th century. The Umekoji train museum was the highlight of the day. Really. It’s awesome—a lovely, tourist- and English-friendly museum that has cool trains, including two of the trains the Emperor of Japan used back in the day. They have gorgeous metal decals and are beautiful pieces of machinery, too. The museum is built around a huge turntable, used to turn train engines onto different tracks radiating from a central wheel, and the gigantic garage built around it. There’s also the former Kyoto train station, which is the entrance of the museum and is an interesting blend of Western design and Japanese style. 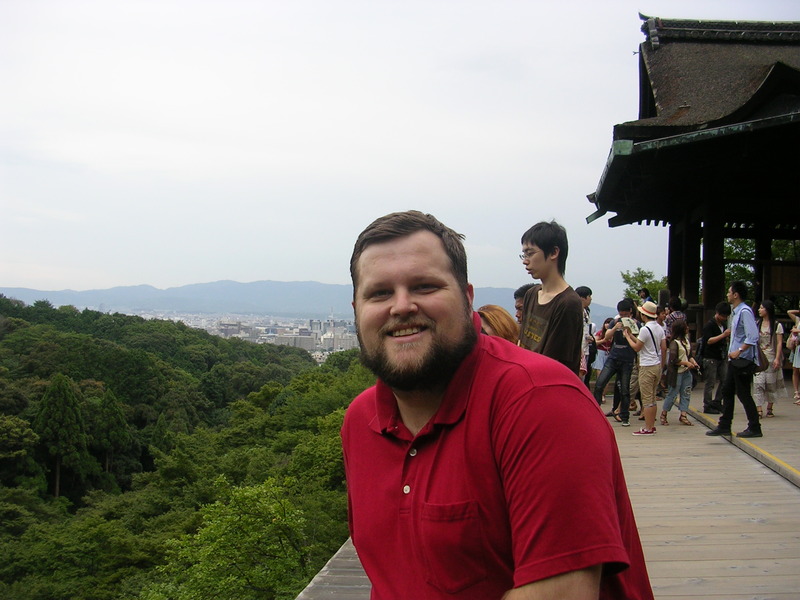 At the lookout platform at Kiyomizu-dera, standing over a several-hundred foot drop and a great view of Kyoto. The shrines and temples were amazing, and each in their own way. The golden temple is breathtaking—you can’t take your eyes off it. The rock garden is just the opposite: subtle, understated, but also alluring. Kiyomizu-dera is amazing in its location, hanging off a cliff supported by ancient wood columns (I didn’t realize this when I first stepped out on the platform or I might have had second thoughts about doing so). And Kyoto has an energy that’s tough to pin down. It’s historic and takes some of its character from that. It’s also a renowned university town, with 37 institutions of higher learning, including the prestigious Kyoto University. At the same time, it’s losing some prestige among Japanese cities, with little industry and declining importance. I wish I had more time to spend there, but in my whirlwind day I feel like I got some tiny idea about what this city is about. Now, it’s on to three final days at Tsubaki before the long trip back to my wife and home.